Benny Green (Terry Sue Patt) has the honour of being the first pupil we see entering the grounds of Grange Hill. Quite why he’s so early isn’t explained here – but it’s obvious from his opening scene that he lives for football. He’s also black and poor – both of which were considerable disadvantages in late seventies Britain – but he’s always a positive character and never spends his time complaining about what he doesn’t have. This opener is quite effective in demonstrating how intimidating a comprehensive school could be on your first day and the key part of the episode is the way that the various pupils react. Tucker (Todd Carty) and Alan (George Armstrong) take it in their stride whilst Judy (Abigail Brown) and Justin (Robert Morgan) view the place with barely disguised horror. Both are isolated, since all of their old friends have gone to different schools. Trisha (Michelle Herbert) on the other hand, seems to regard the new school with complete disinterest. Most are placed under the care of Mr Mitchell (Michael Percival). As their form tutor, Mr Mitchell will be a key figure in guiding them through the school year and it’s clear from the outset that he’s both funny and compassionate. On the other end of the scale is Mr Foster (Roger Sloman) who we’ll see more of in episode two. He lacks all of Mr Mitchell’s redeeming qualities and his early run-in with Tucker makes this quite clear. It’s somewhat staggering to learn that Sloman was only thirty two at the time this was made, as he looks a good ten or fifteen years older. It certainly bears out the truth that some people aged quicker back in the old days! What will become something of a GH cliché gets its first outing here – a noticeboard with an arrow pointing the way to the assembly hall (which handily can be turned the opposite way to fox a green newcomer!). Ann (Lucinda Duckett), who overslept, is the first pupil to fall foul of this trick as several mean older girls, led by Jackie Heron (Mariam Mann), delight in sending her the wrong way. Even as a child it never struck me as credible that the arrow would be a moveable one (why not just chalk it on the board?) but no matter, it’s certainly a memorable moment. It was a nice touch that the final episode of the final series, broadcast in 2008, ended with yet another changed arrow gag. The more things change ….. Although it might seem surprising that not all of the pupils are working class (the likes of Tucker, Alan, Benny and Trisha are firmly working class whilst Ann, Judy and Justin are resolutely middle class) this was an intentional move on the part of Phil Redmond. One of the themes he wanted to explore was the way that Comprehensive Schools took in a range of pupils of mixed abilities and backgrounds – as opposed to the grammar/secondary modern split which had existed before. It also helps to set up the possibilities of conflicts based on class, which would always be a fruitful avenue to explore. 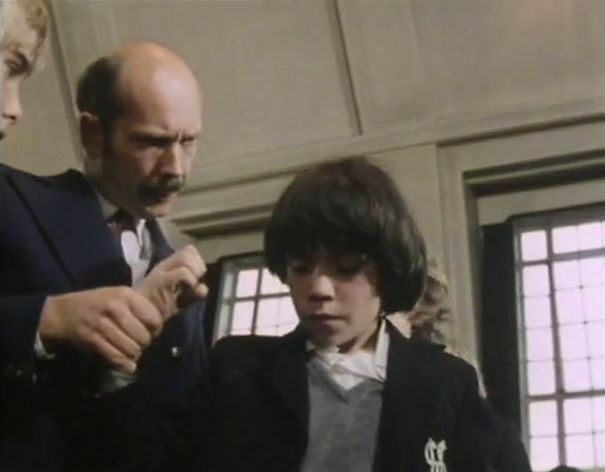 Like a number of episodes from the early years, most of this one was shot on film and on location at an actual school. Although single-camera filming would have been more expensive and slower than multi-camera videotaping in the studio there were obvious advantages – both aesthetic and financial. The gloomy vistas of a real school (endless corridors seemingly stretching to infinity) are more effective at creating a sense of space and isolation than studio sets would have been. Shooting on location also meant that substantial constructions (like the school assembly hall) didn’t have to be mounted in the studio, which made financial sense. Colin Cant’s direction, demonstrated with the screencap above, sometimes liked to favour low angle shots. It’s an obvious but effective trick – since the camera is positioned around Tucker’s eyeline, it makes Mr Foster seem more imposing than he otherwise would be. By the end of the episode we’ve seen Tucker and Trisha clash for the first time and everything now seems to have settled down a little. The mystery of Alan’s surname (given as Turner in the episode, Hargreaves on the end credits and later to be changed again to Humphries) is a mystery that’s never been explained (at least not to me).